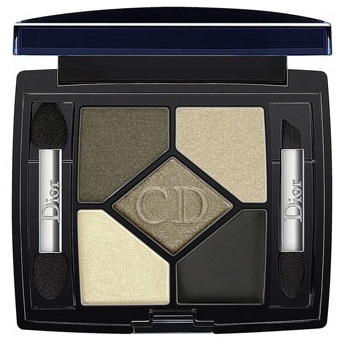 Khaki Design, the second of Dior's Couture Colour Eyeshadow Palettes (#308, $59) introduced with the Golden Jungle Collection for Fall 2012, is gorgeous. I think it's a must-have for khaki lovers. An ultra-professional and totally new version of the 5 Couleurs Eyeshadow Palette [Fards à Paupières in French]. Five different textures have been brought together in a single case to create eye shadow styles through layering. The 5 Couleurs Palette in Khaki Design puts a wild twist on sophistication. Unlike the Golden Savannah Palette, which I featured last week, this one has no duds (duds defined as sparkly, poorly pigmented shades). I love all the shades in Khaki Design. I applied all five shades with a sponge-tipped applicator, swatching clockwise and ending in the center. I took my swatch photos in full sun. As you can see, the khaki at top left in the palette is intense. It's a beautiful shade with a lot of charcoal in it - at least on my skin. It still looks Khaki, and applied with a light touch, it's a great fall shade. The sparkling pastel taupe below it has color (yea!). The shade has substance. It's a gorgeous highlighter or base shade. If you look carefully, you might even see a teeny tiny khaki hue in it. It's possible that's just a reflection from the other shades. The cream-formula eggplant-tinged brown is a fabulous complement to the other shades in the palette. The ivory is saturated and shimmering. It is 100% better than the dud color in the center of the Golden Savannah palette. The center color in Khaki Design, shown at the bottom of my arm, is a drool-worthy, shimmering khaki of light-to-medium intensity and a glowing look on the lid. It may be my favorite shade in this superb palette. I loved the Golden Savannah neutrals, but felt I'd purchased a quad with five shades. With Khaki Design, I got five shades in a 5 Couleurs palette, making it worth every penny of the $59 I paid for it. Khaki Design comes with application instructions, but I rarely pay any attention to the paint-by-numbers suggestions. Do you? It also comes in a little velveteen pouch. I wonder how many little pouches are floating around in my house. I wish Charlie or Savannah found them entertaining; then they would have a use. The Dior Fall 2012 Colors have arrived at Dior counters, and they are selling at a brisk pace. I'm never sure whether that's an indicator that the store purchased an inadequate supply or whether the item is fabulous. If you'd like to try or purchase Khaki Design, I'd suggest you do it soon. Clarisse, this will look amazing on you! Oh well, Becca, won't be the first time a makeup lover broke a resolution. I actually love the dud color in the golden savanna. It gives a very flattering sparkles(i.e. blurs, not emphasizes, texture imperfections of the eyelid layered on top of any shade in the center of the eyelid. I think if it were not sheer, it wouldn't give such pretty effect.